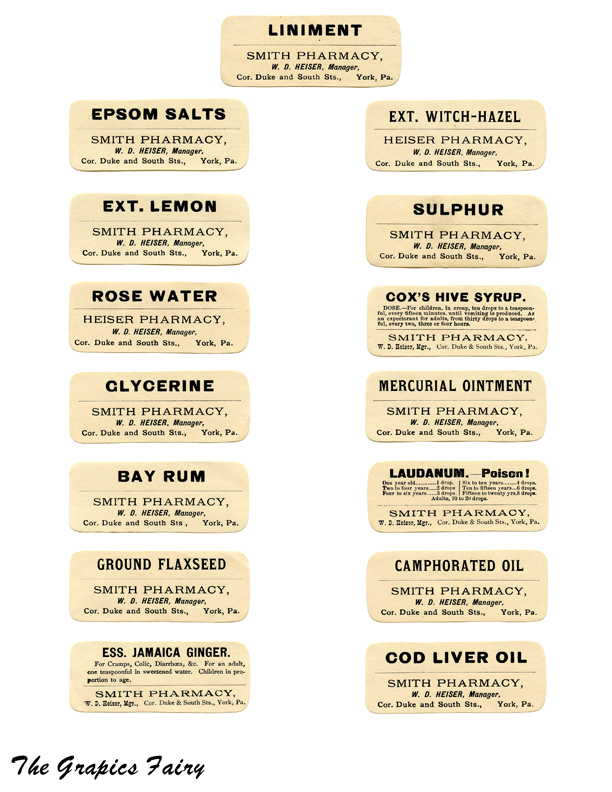 Here we have a nice collection of Free Printable Vintage Pharmacy Labels! I have had these for many years and recently came across these interesting labels once again. I have had a few of these on my blog in the past, but I have scanned even more and put them all together on one Printable for you to make them easier to download. These were all originally from a Pharmacy in Pennsylvania. I don’t remember where I purchased them, but I have lived in both Pennsylvania and Maryland so I must have picked them up back then, possibly at a local flea market. These would be fun to add to some glass bottles to use in a Vintage Display. Or use them in your Collage or Mixed Media Art pieces. Each of the labels are rectangular in shape with rounded corners and have a creamy paper background. If you didn’t want to fussy cut them, you could always use a paper cutter and then clip the corners with a rounded corner punch. 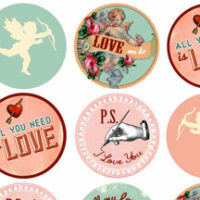 There are 15 Vintage Labels in all included on the Printable Download. Make sure you use the Purple Download Button below to grab the Highest Resolution version of the Printable. There are all sorts of different remedies and medicines listed on these Pharmacy Labels. Some were probably used for Beauty applications, like the Rose Water and the Glycerine and the Bay Rum for scent (if you were a man that is). Some of them sound like edible ingredients like the Ground Flaxseed and the Extract of Lemon. Then we have the ever popular tried and true Epsom Salts and Cod Liver Oil. We have Extract of Witch Hazel, which could have been for beauty as well, but wouldn’t it be fun to use in a Halloween Project! We’ve got Essence of Jamaica Ginger, Cox Hive Syrup and Laudanum which have the instructions right on the label. I think it’s interesting that the Ginger instructs that the dosage should be less for children according to their age, but does not actually say the exact amounts. I’m guessing that the Liniment was some type of soothing cream or ointment. The Mercurial Ointment was apparently used for a very nasty disease, that is probably best not to mention here on a family friendly site like mine. Ha! I will let you Google it and find out for yourself, or read the comment below by Cate, as she looked it up and kindly posted the info on her comment. And lastly we have the Sulphur and the Camphorated Oil Pharmacy Labels. I have no idea what those were for. Do you remember any of these Old Fashioned Pharmacy products? Were some of these your go to remedies in your parents or grandparents home? I can just imagine the charming old Pharmacy that these were once used in. Perhaps the Pharmacist used some Mortals and Pestals to grind and mix up the concoctions, for the customers as they came in with their prescriptions. 14 Victorian Ladies with Signs – Labels 12 + Floral Journaling Cards or Labels – Updated! Valentine Printables – Labels – Flags – Cupcake Toppers! Thanks Genevieve, you can put me in the compulsive collector category too! Thanks Cate! Ok, well I definitely did not use Mercurial ointment then. Haha! I just googled it, looks like I was remembering mercurochrome which is an antiseptic. Thanks for providing the info on Laudanum, I watch a lot of PBS and it did seem to be a problem back then, typically with the ladies it seems. So sad. It seems like when I was a kid, in the 40s and 50s, we used Mercurochrome or something like that for cuts and bites. I know we had Iodine, which was red and I think the other stuff was too. Did you see anything like that during your search? And I thought we were given SULPHUR for bacterial infections but I guess it was SULFA. I don’t know if that on the label was in any way related, but what we got tasted terrible! I guess Penicillin wasn’t in widespread use. Thanks, Karen! I’m also a collector, but I do occasionally use images for calendars and I frame some of them. I just love vintage images! Actually, I am a hoarder more than a collector. I hate deleting any of them. thank so much i love to do crafts and the vintage looks are so beautful. Thank you Lecolia, I am so glad you like them, enjoy!